Throughout the season, philadelphiaflyers.com will take a look back at some of the Great Moments in Flyers history with contributing writer Bill Meltzer. We will also be providing rare, and never-before-seen multimedia from the archives here in the Wachovia Center to supplement each column. 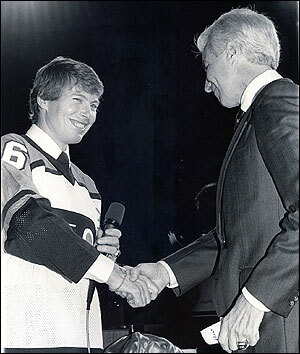 Bobby Clarke may hail from Flin Flon, Manitoba, but he’s as Philadelphian as they come. To anyone who grew up a sports fan in the Philadelphia area during the 1970s to early 1980s, Bobby Clarke was more than just a superstar center for the Flyers. The three-time Hart Trophy winner connected so deeply with a generation of fans that it’s hard for outsiders or those who only knew of Clarke as the team’s general manager to fully understand how deeply the Flyers’ captain was engrained in the hearts and minds of people in the Delaware Valley. Before there was the fictitious Rocky Balboa character, there was Bobby Clarke leading an underdog hockey team to the sport’s ultimate prize in two straight seasons (and nearly a third). 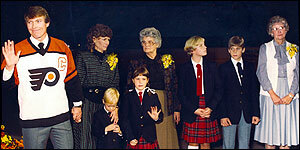 The fact that Clarke came from a humble working class background, overcame diabetes, was passed over in the first round of the NHL draft because of the disease and became the NHL’s Most Valuable Player despite having less natural ability than many of his peers made him all the more endearing to the sporting populace. Fred Shero once called Clarke “a dream dressed in work clothes,” and it was an apt description of the way both his team and the fans viewed him. On a club filled with leadership and hard-working, team-oriented players, Clarke was the pace-setter. “I never thought I was working hard, it was just the only way I knew how to play the game,” Clarke has said on many occasions. But to his teammates, Clarke’s work ethic set the tone for a winning environment. As long as his fellow players devoted themselves fully to the success of the team, Clarke supported them to the hilt. The foundation of the Broad Street Bully era’s extraordinary bond on and off the ice was forged – and zealously protected – by its captain. “Clarkie’s always been about actions more than words,” said longtime Flyer Bob Kelly. “We all knew what it meant to wear the Flyers uniform, and Clarkie was a big, big part of that. It wasn’t about stats or any of that other individual stuff. Every night, the only goal was to win. Clarkie never acted like his role was more important than anyone else’s, and that was a huge thing for all of us. To Flyers fans, Clarke personified the type of work ethic and never-say-die attitude that Philadelphians aspire to. He was brave and he was unselfish. It is not hyperbole to say that whenever “Clarkie” took to the ice, Flyers fans responded to him as though he were playing just for them. Every goal he set up or scored were small personal victories, every drop of blood on his uniform was shed not just for the team, but for the fans. From Northeast and South Philadelphia to the western suburbs and South Jersey, Bobby Clarke was a living, breathing folk hero during his playing days. This is how deeply he was engrained in people’s daily lives: On any given day, young boys throughout the Delaware Valley brought Bobby Clarke Brand peanut butter sandwiches to school for lunch and then came home to play street hockey with their Bobby Clarke-endorsed street hockey sticks. If you randomly walked around area shopping malls in the mid-1970s, you’d see numerous males and females wearing “Bobby” t-shirts emblazoned with Clarke’s photo or unofficial orange and black jerseys with the number 16. Meanwhile, the success of Clarke and the Flyers inspired the first substantial youth ice hockey boom in the Philadelphia area. Local coaches and hockey parents encouraged kids to watch and emulate the Flyers’ captain on the ice. When Clarke retired as an active player after the 1983-84 season to accept the post of Flyers general manager, the team arranged a special night in his honor on November 15, 1984. That night, the Flyers took on the struggling Hartford Whalers. 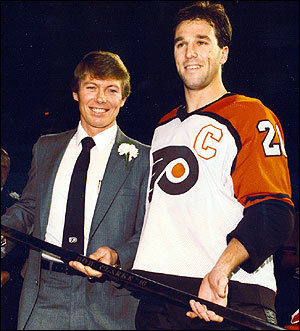 But no matter the opponent, a win on Bobby Clarke Night seemed almost guaranteed. The players had a little extra incentive to deliver. “We had the youngest team in the NHL at that time, but it was an outstanding group of players. For me personally, it was an honor just to be a part of the legacy that Bob Clarke created,” said Dave Poulin, the captain of the team, which later reached the 1985 Stanley Cup Finals. The sold-out event, airing on the subscription cable service Prism, was broadcasted for free throughout the region. Legendary Flyers broadcaster Gene Hart served as master of the pre-game ceremonies honoring Clarke. Among the tributes that poured in, the most enduring accolades were the retirement of Clarke’s number 16 jersey, the unfurling of a banner in his honor and the dedication of the Bobby Clarke Trophy, which is now awarded each season to the Flyers’ most valuable player. But for those who were in the building that night, the most memorable part of the night was the length and volume of the Spectrum crowd’s standing ovation for Clarke. For over four minutes, the Philadelphia fans applauded and screamed in unison. That said it all. “The atmosphere was incredible. It was one of most amazing things I’ve ever experienced,” said Brian Propp, who played as Clarke’s teammate for the first five of his 10-plus seasons in Philadelphia. When the puck finally dropped for the start of the game, the Flyers asserted their dominance. Hartford had some notable talents on the club, including the young Ron Francis, Ray Ferraro and former “Miracle on Ice” Team USA member Mark Johnson, but simply lacked Philadelphia’s depth at every position. In a performance worthy of Clarke’s Stanley Cup era clubs, the Flyers outworked their opponent in all three periods. By the end of the first period, Philly had jumped out to a 3-0 lead on even-strength goals by Derrick Smith, Poulin and Tim Kerr. Propp drew assists on both the Poulin and Kerr tallies. The Kerr goal was scored in the final half-minute of the period. The Whalers got one back on a Risto Siltanen power play goal midway through the second period, but it was the only puck they got past Flyers’ goalie Pelle Lindbergh. The Vezina Trophy winning keeper turned back 26 of the 27 shots he saw on the night. Meanwhile, the Flyers quickly restored their three-goal cushion as Kerr scored his second goal of the night three minutes after Siltanen got Hartford on the board. Murray Craven earned his second assist of the game on Kerr’s power play goal, while Ilkka Sinisalo was credited with the other helper. Lindbergh preserved the 4-1 lead through the first 15 minutes of the final stanza, and then the Flyers turned the game into a rout. Checking line forward Rich Sutter scored his first goal of the season at the 15:40 mark. A mere 17 seconds later, Craven made it a 6-1 score. Craven was named the game’s first star, Kerr was second and Lindbergh third. After the game was over, the attention shifted back to the events that occurred before the game. Among others, Lindbergh admitted that he had a little extra motivation to play a strong game on Clarke’s special night. Having grown up a Flyers fan in Sweden (Lindbergh even wore a Flyers logo on his Bernie Parent-style mask while playing for the Hammarby youth club and the Swedish national junior team), Lindbergh knew what Clarke meant to the organization even before the two became teammates in the early 1980s. Twenty three years after Bobby Clarke Night, older Flyers fans often still refer to Clarke as Bobby when discussing his playing days and as Bob when referring to his front office career. Bob Clarke was subject to the scrutiny and second-guessing that accompanies the highs and lows of being an NHL general manager. But Bobby Clarke was and will always be the enduring, resolute symbol of the Philadelphia Flyers. He turned an expansion team into champions and restored pride to a city at a time when it was desperately needed.